One of the cooler aspects of the Green Lantern storyline is that, with the exception of our hero, every other member of the intergalactic corps is a member of an alien species. Thanks to the trailer that was released last month, we've already seen a wide variety of these characters, including Kilowog, Sinestro and Abin Sur. 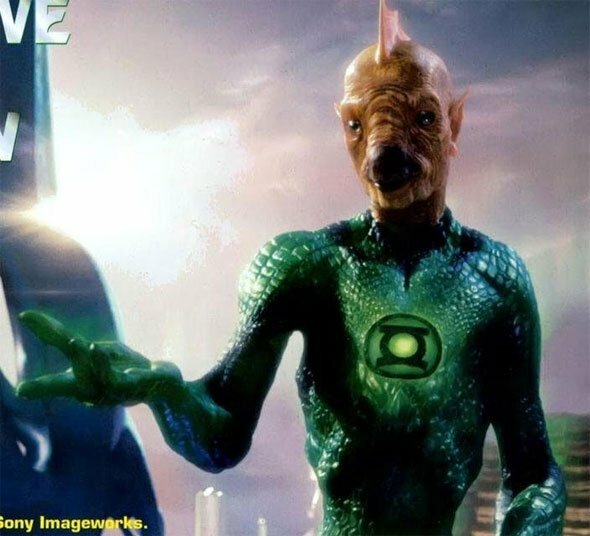 But while most of the screenshots of those characters were fairly clear, one alien that we didn't get a very good look at was Tomar-Re, the chicken/fish-looking guy who was a scientist from Xudar before joining the Green Lantern Corps. Now, thanks to CBM, we have our first clear look at him. The picture looks as though it was scanned out of a magazine, but the source that sent it in apparently didn't identify what publication the picture is from. In the comics, the character tends to look kind of goofy, but I must say that I like this design. That said, he is amazingly ugly and I kind of hope he doesn't have too big a role if not only so that I don't have to hear children cry whenever he pops up on screen. Check out the image below, or to see it full size, head over to CBM.